Pulsed Power - What is it? Pulsed power is the engineering discipline (and art) of accumulating electrical energy relatively slowly and then discharging it relatively quickly into a load. The discharge is usually a very short event compared to the accumulation; hence the term "pulsed". Because the energy is discharged more quickly than it is accumulated, the discharge occurs at a higher power level than the accumulation; hence the term "power". The most commonly occurring natural example of pulsed power is lightning. Under normal conditions, wind and atmospheric processes accumulate electrical energy in clouds. 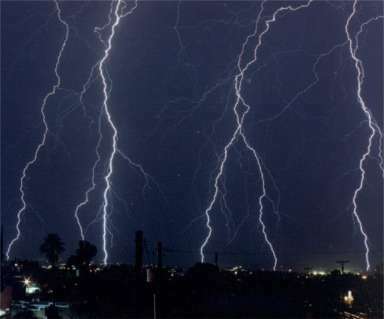 Lightning is the result of the cloud discharging the energy back to the ground or to other clouds. Man-made pulsed power is accomplished through the use of systems such as Marx generators, Van De Graff generators, pulse transformers and other systems. Some uses of man-made pulsed power include weapons for the military; the acceleration of particles in accelerators used to study particle physics; and the intense compression of materials used to study fusion for future power generation. should be directed to the ASR Corporation webmaster. All rights reserved ASR Corporation 2000.